Port Lincoln is well known for its fishing industry including tuna, oysters, King George Whiting and King Prawns. It’s a regional centre that reminded us a bit of Geraldton in WA. Around 14,000 people and a reasonable shopping/business district as well as a lovely foreshore park and beach. We’ve been here before when we stayed in the Lincoln National Park in January 2010. The Driver has been here many times with work as well. An afternoon drive out to Fishery Bay was well worth it. Big swells were rolling in from the south and combined with a reasonable offshore breeze, there was some good surf and a few out to catch a wave. Walkways and stairs are in strategic places around the bays and provided great vantage points to watch the ocean and enjoy the beautiful views. 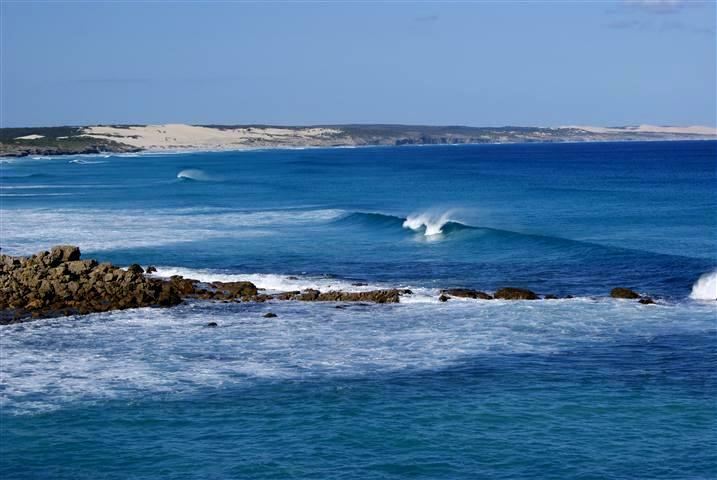 Sleaford Bay had some swell and waves too, but it was the amazingly clear aqua water that was the highlight. Youthoria Cinema was screening Red Dog and so went along on Wednesday night. We sat on an old sofa in the main hall below the theatre seats – a very relaxing way to see the movie. Red Dog was a terrific story and there were some characteristics that really reminded us of our old blue friend, Skip.